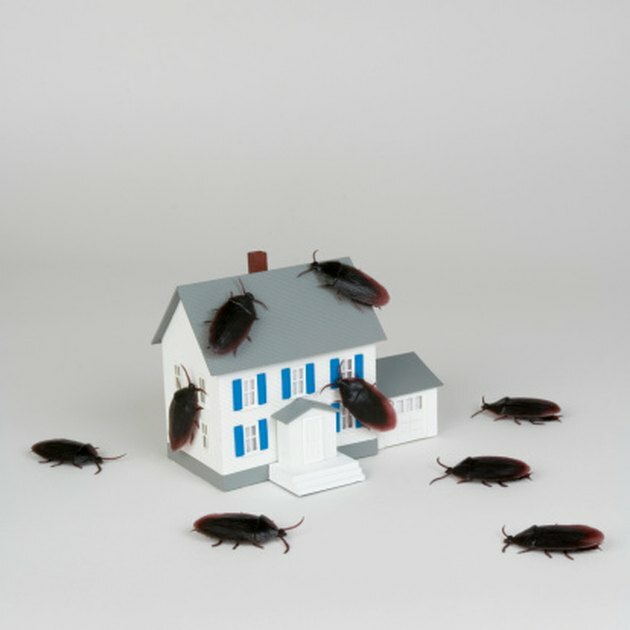 The best domestic roach killers and repellents are more than just effective and easy-to-use, they're also long-lasting and capable of producing continuous results after the time of application. For example, as the University of California Davis notes, liquid spray and aerosol roach-control products might kill insects on contact but the products only scatter roach populations as opposed to making a significant impact on wiping out the underlying infestation. Cockroaches are beetlelike insects that commonly invade homes in search of food. Boric acid powder is one of the most popular and time-tested compounds for killing and repelling cockroaches. A derivative of the natural mineral borax, the odorless powder is lethal for many insects, including palmetto bugs and water bugs as well as roaches. In addition to being toxic, boric acid has a positive electrostatic charge, which causes powder particles to cling to the bodies of roaches. Unlike other types of roach killers, which provide nearly instantaneous insect death, boric acid is slow-acting. This allows time for the roaches to carry the poisonous powder back to their nests and infect other roaches. One of the best boric acid-based cockroach products, according to BestCovery, is PIC Boric Acid Roach Killer, which contains specialized preservatives for preventing the powder from clumping. And while boric acid is potentially toxic to humans, poisonings occur only after repeated long-term exposure to the powder or after the direct ingestion of the powder, as MedlinePlus mentions. You can avoid both of these problems by carefully following the manufacturer's instructions for the particular boric acid product you are using and by storing the product in a secure location, out of the reach of children. While cockroaches accidentally ingest boric acid as a result of its static charge and clinging-nature, the goal with bait stations is to trick the cockroaches into directly consuming and transferring items laced with poisons. One of the best roach bait stations, as BestCovery states, is the Combat 12 Month Bait Trap, which -- like boric acid -- can offer long-term roach protection. The Combat product uses baits that contain the toxic substance fipronil. Bait stations are typically safer roach killer and repellent options for homes with pets, as their toxic materials are enclosed within a protective housing that is large enough only for insects to enter and exit. Gels are specialized types of roach baits, which people often use independently of bait stations. The baits typically come with syringes or application guns, allowing you to apply the substances into the crevices and cracks of your home. According to BestCovery, one of the best roach gels available is Advion by DuPont, which is suitable for indoor and outdoor use. The gel contains the high-performance indoxacarb chemical as its active lethal ingredient. Unlike boric acid and bait stations, however, gels require frequent reapplication -- usually once every three days -- to ensure potency. Can Boric Acid Get Rid of Silverfish? What Is the Best Pesticide to Kill Ticks?